Every year I’m surprised. All news channels look back on the year and it turns out I’ve forgotten at least 95% of it. Largely. Besides the feeling of surprise, it makes me feel a little ignorant, too. However, these news channels all show why my brain banished most of those news items, as most are terrible tragedies and other depressing facts. But it’s not only these facts that I seem to have forgotten. Also the good things that happened, the beautiful moments that popped up along the road I travelled during that year – blurry memories as well… That saddens me a bit as it occurs to me that remembering such things could give a nice positive boost at the start of the new year! 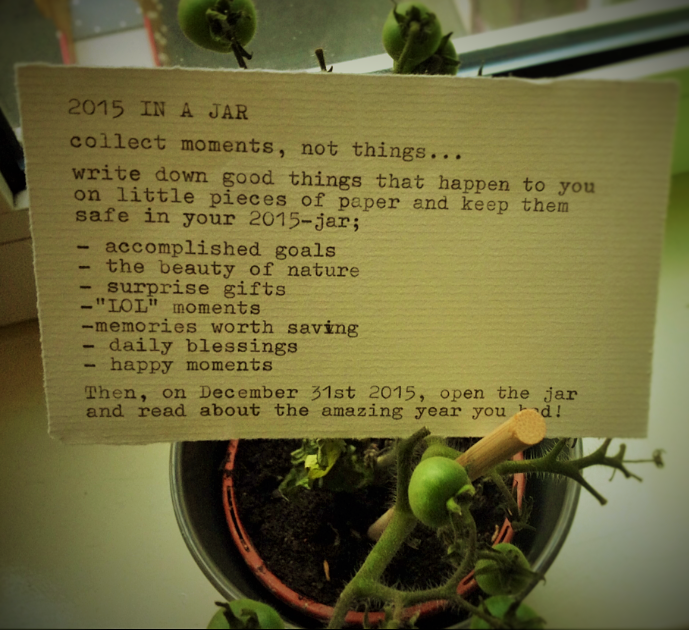 So this year I started my 2014-in-a-jar. I found the idea somewhere on the internet and immediately decided that was going to be the trick for me. It’s easy as one-two-three. You can make it yourself. Use an old jam jar. Or a weck jar. Maybe you’re more the box-type. Shoe-boxes may do, too! There are no rules. Or maybe this is more your style? If you feel totally lost at only the thought of that jar, here are some guidelines. Just to help. My weck jar has really helped me become more aware of interesting moments and beautiful happenings. It absolutely is a good way to stand still and see what you have. To realise it’s not all that black and negative. And to be thankful for it. Tomorrow I will open my weck jar and carefully read the collected moments. I will use them to write a short review on my 2014. Then the jar will be ready for 2015.